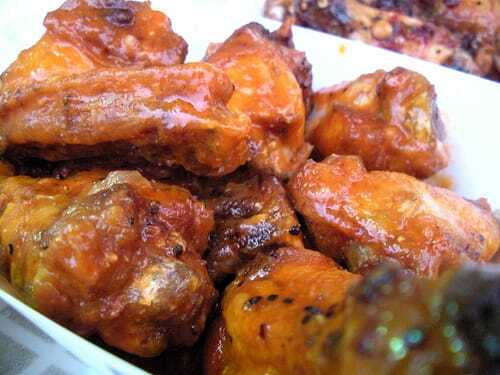 I have always been a big fan of wings — buffalo wings, BBQ wings, teriyaki wings — I am an equal opportunity wing eater. Bit when I learned the nutritional value of most wings, I pretty much figured that I could never again enjoy that chicken wing yuminess without totally destroying my Weight Watchers Diet Plan. When I found this awesome crock pot recipe — a delicious Teriyaki Wings recipe for just 2 Weight Watchers Points, I was beyond excited. I HIGHLY recommend giving this tasty chicken wing recipe a try. Because it’s cooked in the slow cooker for so long, the meat REALLY soaks up the sauce and becomes so moist and tender and full of flavor. These teriyaki wings are better than most of the wings I’ve had a restaurants!! And yet, they are low in Weight Watchers Points, and are one of the best low calorie recipes for wings that I’ve ever found! Keep checking LaaLoosh for more tasty wing recipes like my low Point Buffalo Wings Recipe and my low Point Honey BBQ Wings Recipe! Rinse chicken and pat dry. Cut off and discard wing tips. And cut off as much of the chicken skin as you can. Cut each wing at joint to make two sections. Place wing parts on broiler pan. Broil 4 to 5 inches from heat 20 minutes, 10 minutes a side or until chicken is a light, golden brown. Transfer chicken to Crock-Pot Slow Cooker. Mix together onion, brown sugar, soy sauce, cooking sherry (or chicken broth), ginger, honey, and garlic in bowl. Pour over chicken wings. Cover and cook on Low 5 to 6 hours or on High 2 to 3 hours. Stir chicken wings once to ensure wings are evenly coated with sauce. Serve from Crock Pot. how in the world do you skin chicken wings?! Hi!ilove your recipes! Can u put this oven oven baked chicken tenders instead of wings? Did you ever figure smartpoints? Loved them be interested the point differents. i just calculated this on my WW app for the smartpoints.. and it comes up 9 SP per 2 wings. is this (and the other recipes on the site) smart points, or the old point system? This is the old points system :(. Unfortunately, I didn’t convert this one to the new system yet. Can I use skinless drumsticks for this recipe? Do I still follow the same broiling instructions for them? This was my first LaaLoosh recipe and it was so incredibly tasty! I took these to a New Year’s Eve party and they were the first to go. Grown-ups and children alike devoured these and the smell in the slow cooker nearly drove me crazy. Will make these again! I tried these for the first time a few nights ago. I was looking for slow cooker recipes because I never really done a lot of slow cooking. They were the best wings I ever made. I can’t believe how tender they were and how much flavor they had. They will be a regular at our house Thanks so much for taking the time to build this website can’t wait to try the buffalo wings. I was skeptical about this one. Only because I have a traditional Buffalo wing lover and wasn’t sure about eating a wing cooked any other way than fried. But wow! My wife and I made these yesterday and they were way better than I thought. I’d definitely do these babies again! I made these last night…the wings literally fell apart they were so tender and the flavor was all soaked into the meat…we just picked the bones out and put the meat and sauce over a rice noodle and veggie stirfry I had made as a side…it was WONDERFUL! My teenage sons asked “Why don’t you always cook like this?” I’d say everyone was pretty impressed. I made this tonight and they were AMAZING!!!!! I will most defiantly make this over and over again! The only thing i did differently was instead of putting them in the crock pot I placed them in the oven on 250 degrees for about 35 minutes because of time and they were still very tasty! I put this recipe in the online Weight Watcher's recipe builder and it came out to be 8 points!! What gives? Ugh…that Weight Watchers Recipe Builder can be pretty finicky. I NEVER use it, because, depending on the brand of each ingredient, the Points can really vary. When making this WW wings recipe yourself, the best way to get the most accurate Points Value is just to total up all the nutritional stats on your own. I made these tonight. My family LOVED them. They had no idea it was a healthy recipe! Far better than any sauce you can buy at the store. Definately will make again. Forgive me if I missed it, but what is the serving size on these wings? This is the most FANTASTIC crock pot recipe I have ever made! I recommend adding a few dried chiles to the sauce while cooking for a little kick of spice. The whole family couldn't get enough of these. I served over brown rice and broccoli. It was similar to General Tso's, but better and I didn't feel horrible about eating it afterwards! Is there any way you can give me the nutritional info from the Trader Joe's wings so I can compare it with a brand like, say, Tyson to see what the difference is? I don't have any chicken wings in the freezer right now, but the next time I get some, I'd be happy to post the nutritional info! Anyway to tell how many calories per wing you are getting, I am making this for supper and I need to know :( Also I used reg soy sauce because I didn't have low salt. Sorry, but I don't know the exact calories for this recipe. In all Weight Watchers Recipes, they list only their Points value…not the calories. You could absolutely do this with chicken breast, though keep in mind, it would end up being very little meat. With wings, so much of the chicken is bone, so you actually end up eating very little chicken and skin. If you used chicken breast, you'll have to weight the meat and calculate the Points total based on that. The sauce really accounts for about .7 Points per serving. BUT, I do have a super yummy buffalo chicken strip recipe that will rock your chicken strip lovin' world…so check back tomorrow to get it! How about doing this receipe with chicken breast? Thanks for your input and keen observance, Cindy! I based this recipe on a bag of wings I bought at Trader Joe's, and according to the listed nutritional information, it did correctly add up to 2 Points. It really just depends on the type of wings you get. I think it's mostly because the wings are small, and most of the Points content covers the skin. Hope that helps! If your leaving the skin on these wings, I believe it would have to be way over 2 points a serving.